Independence Day Weekend Oil Change Coupon! 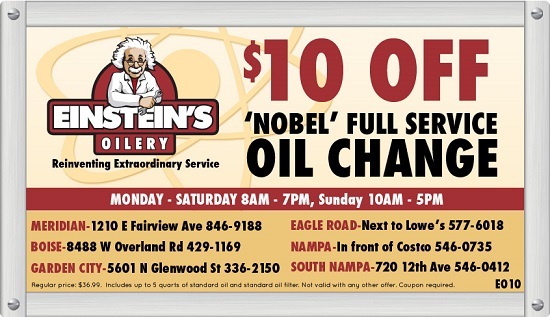 Get your vehicle ready for holiday road trips this weekend with a 'Nobel' Full Service Oil Change and save $10 with our online coupon! Get your printable coupon here: OIL CHANGE COUPON or simply present the coupon above on your mobile device at the time of service. Happy Independence Day Treasure Valley!